Nielsen SoundScan registration is included with your purchase of a UPC code. There is no charge for Nielsen SoundScan registration. During the registration process, Nielsen SoundScan will ask you to enter a selling price for your album. 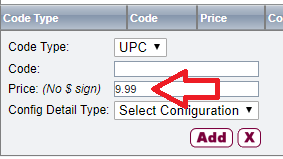 This field will automatically be filled with $9.99 but you can enter whichever price you would like.